Motorhome reversing can sometimes be a tricky affair and some drivers will want all the help they can get! Many motorhome insurers, including here at Caravan Guard, will offer a small insurance discount for motorhome reversing aids, for their help in preventing claims for damage when parking or pitching up. Some reversing cameras offer a dual view, one for parking and also one whilst travelling to give drivers a great rear view on the road. It’s not uncommon for motorhome manufacturers or converters to offer reversing cameras as standard or as part of their optional extra packs. And there are lots of aftermarket motorhome reversing devices that can be fitted too – sensors often representing a lower cost option than a camera. Our recent poll asked owners if they had a motorhome reversing camera or sensors and it was pleasing to see the results. With almost 200 votes, a huge 86 per cent said they had some kind of rear view help. The most popular aid for reversing your motorhome was a reversing camera with 61 per cent of the votes. And 15 per cent of voters were extra safety conscious with both a motorhome reversing camera and sensors. Just 10 per cent had parking sensors on the back of their ‘van. 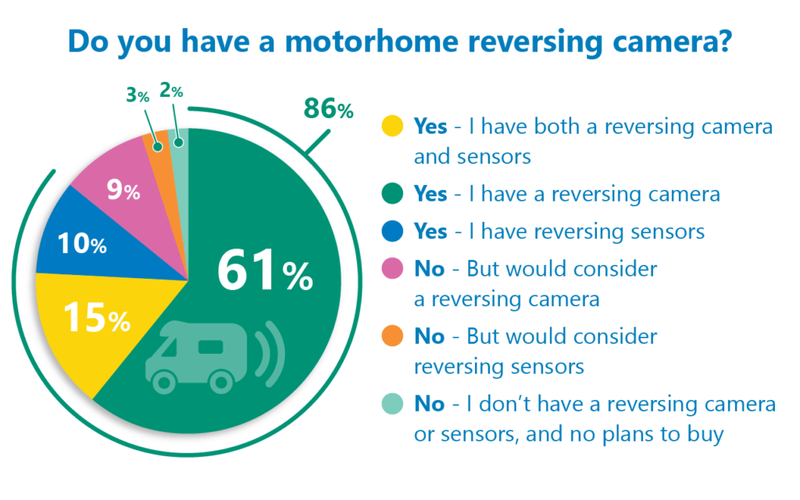 Of the 13 per cent of voters who didn’t have any motorhome reversing gadget, nine per cent said they would consider buying a camera and three per cent would consider sensors. Only two per cent had no plans to buy either. Many of you commented about how useful a reversing camera is in saving a potential scrape, although we did receive a few comments about poor visibility if it’s very bright sunlight or rain. Ben Robinson has a dual camera setup on his motorhome, allowing for a rear view whilst driving and downwards view for parking, plus reversing sensors with audible beep, and said he would really struggle without them. Brian Barrow also has dual cameras on his motorhome. He said they were useful some of the time – but not in bright sunlight. Philip Price said his reversing camera had saved many a potential scrape. “Most recently, a pitch was overshadowed by tree branches and although the way was clear to reverse, it was not obvious that the branches were too low for my motorhome. A quick glance at the monitor whilst reversing avoided a disagreement with the tree,” Philip added. But many still rely on the good old fashioned ways when parking up – like using a partner or in some cases walkie talkies. 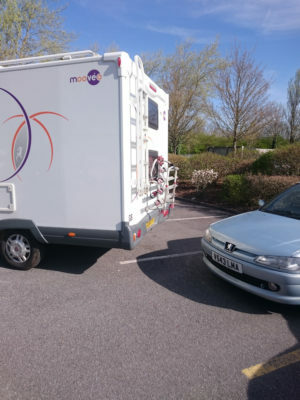 Whilst Paul Clarke thinks a motorhome reversing camera is a boon, he said there was no better way of preventing the back end saying “hello” to an obstacle, than the passenger getting out and watching too! Richard agrees, commenting that it’s not always easy to judge distance with the camera alone. He often enlists the passenger’s help as well. John Barton takes a pair of walkie-talkies on his motorhome travels. “In difficult situations it’s nothing like having someone on the end of the walkie-talkie to describe what is going on,” he said. For our top tips on reversing your motorhome like a pro click here. My wife always watches me reversing, even though we have a reversing camera. A reversing camera is very useful but if it is raining the lens is covered in rain drops which makes the view useless. I have asked if there is a way to keep the lens dry/clean (something like a windscreen wiper ?) and been told it does not exist. The nearest aid I have tried is a spray coating on the lens which makes the rain drops wet the surface and so form a flat, non-distorting water film on the lens. A good theory which doesn’t work. They’ll be very much more difficult to install! I have fwd and reverse cameras my reverse camera is on at all times when driving so that I can observe my tow car behind on its A frame and to check that HGV lorries on the motorway are not following too close. Thanks Peter. They’re clearly useful for more than reversing. We also offer a discount on your motorhome insurance for reversing aids. Useful – I have just had a minor disagreement with a wall at no more than 2mph, broken the rear lamp cluster and also somehow disconnected the feed to both rear lamps and brake lights. Estimate it will cost getting on for a couple of hundred to put it right. And I’ve done it before – perhaps it’s time to get a camera!! Plus we offer a small discount on your motorhome insurance for reversing aids.